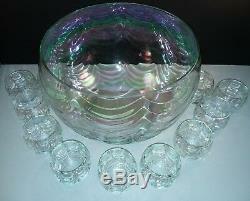 Gorgeous West Virginia Glass Mother Of Pearl Loop Optic Punch Bowl With 11 Matching Cups. In good gently used condition. 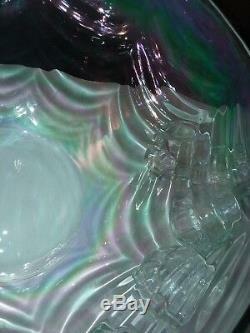 (no ladle is pictured but I will throw one in) One punch cup has a shallow small chip in rim. Otherwise no chips or cracks. 12 inches at widest point of bowl. 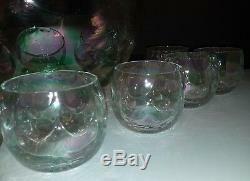 Cups are 2 1/2 inches tall by 2 1/2 inches wide. Look at pictures for additional measurements. SHIPS FAST & VERY CAREFULLY! 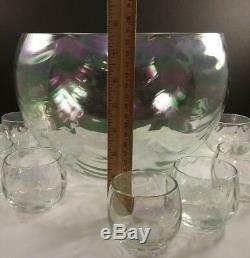 The item "WEST VIRGINIA Glass Iridescent Luster Loop Optic Punch Bowl & 11 Punch Cups" is in sale since Tuesday, August 28, 2018. 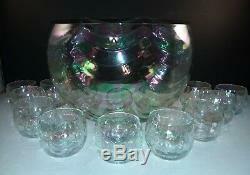 This item is in the category "Pottery & Glass\Glass\Glassware\40s, 50s, 60s\Other 40s, 50s, 60s Glassware". 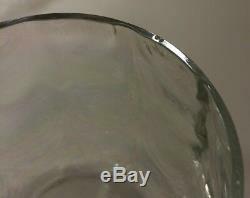 The seller is "sidde1234" and is located in Kenosha, Wisconsin. This item can be shipped to United States, Canada, United Kingdom, Denmark, Romania, Slovakia, Bulgaria, Czech republic, Finland, Hungary, Latvia, Lithuania, Malta, Estonia, Australia, Greece, Portugal, Cyprus, Slovenia, Japan, China, Sweden, South Korea, Indonesia, Taiwan, South africa, Thailand, Belgium, France, Hong Kong, Ireland, Netherlands, Poland, Spain, Italy, Germany, Austria, Bahamas, Israel, Mexico, New Zealand, Philippines, Singapore, Switzerland, Norway, Saudi arabia, Ukraine, United arab emirates, Qatar, Kuwait, Bahrain, Croatia, Malaysia, Brazil, Chile, Colombia, Costa rica, Dominican republic, Panama, Trinidad and tobago, Guatemala, El salvador, Honduras, Jamaica, Antigua and barbuda, Aruba, Belize, Dominica, Grenada, Saint kitts and nevis, Saint lucia, Montserrat, Turks and caicos islands, Barbados, Bangladesh, Bermuda, Brunei darussalam, Bolivia, Ecuador, Egypt, French guiana, Guernsey, Gibraltar, Guadeloupe, Iceland, Jersey, Jordan, Cambodia, Cayman islands, Liechtenstein, Sri lanka, Luxembourg, Monaco, Macao, Martinique, Maldives, Nicaragua, Oman, Peru, Pakistan, Paraguay, Reunion, Viet nam, Uruguay.